Japanese keyboardist Tadashi Goto has a new prog-fusion album available for pre-order entitled Innervisions. The impressive guest list on this release includes Chris Poland, Brett Garsed, Ty Tabor, Tony Levin, Tony Franklin, Matt Bissonette, Joseph Patrick Moore, Randy George, Sean Conklin, Jose Bernardo and Marco Ahrens. You can listen to samples and pre-order the disc here. 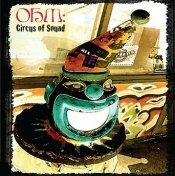 OHM have posted the songs "System of a Clown" and "Photograph" from their soon-to-be-released album Circus of Sound on their MySpace page. They also have two upcoming gigs listed: Aug 15th at The Baked Potato in Studio City, CA and Nov 1st at Alva's in San Pedro, CA. Circus of Sound will be released Aug 26th on the Tone Center label. Hiram Bullock, the original guitarist in Paul Shaffer's "World's Most Dangerous Band" for the Late Night With David Letterman show has passed away at the age of 52. Bullock had been battling a throat tumor since January. In addition to his numerous solo albums, the New York-based funk-fusion heavyweight had a prolific studio career that included recordings with Steely Dan, Jaco Pastorius, Paul Simon, Marcus Miller, and many others. The Scott Kinsey Group has booked the following dates for a European Fall tour. The current incarnation of this awesome band features Scott Henderson on guitar, Matthew Garrison on bass, Gary Novak on drums, and Kinsey on keys. Lots of cool videos popping up lately. Saw this one on Truth in Shredding. This is a clip of Brett Garsed pulled from the Masotti Amplifiers and Guitars Devices site. Saw this on Mark McGuigan's site: More great footage of Scott Henderson's 7/19/08 show at The Baked Potato, courtesy of the Suhr Guitars Gallery. Enjoy! UPDATE 7/26/08: I've replaced the Quicktime version of this video with the YouTube version. The quality is not as good, but the QT version would load in the background as soon as you came to this page, whether you clicked Play or not. I found that annoying so I decided to swap it out. 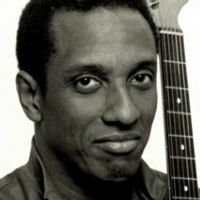 Modern Guitars Magazine has posted a great Greg Howe interview, conducted by Mark Rabuffo. Check it out! This is Scott Henderson playing "Hillbilly in the Band" last night at The Baked Potato. UPDATE 7/26/08: I decided to replace the video I originally posted here with a higher quality version that was uploaded to YouTube yesterday. This is also the complete song. 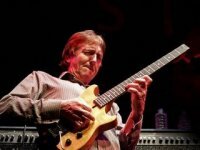 Here is the latest list of dates for Allan Holdsworth's upcoming UK tour.